Shake hands with the president, get on stage with your favorite pop star, or get up close and personal with an A-lister and take the ultimate selfie! Madame Tussauds Orlando is rolling out the red carpet to become Florida’s latest celebrity hotspot and provide visitors with the ultimate fame experience. At the world’s most famous celebrity wax attraction get ready to photograph and pose with your favourite A-listers, get on stage with your favourite pop star, challenge sports legends and even shake hands with the president! This immersive and interactive wax attraction is bursting with family fun. Who do you want to meet? A-List Party - You can make a dramatic entrance as you step out of your luxury super car and mingle with the stars before entering the club. The party is filled with the most glamorous and gorgeous A-Listers – all waiting to meet you. Ryan Reynolds and Selena Gomez are waiting to chat with you next to a stunning fireplace in the centre of the room. Leonardo DiCaprio and Anne Hathaway are desperate to catch up with you, so you wander over to them by the open archways. Music - Are you ready to rock out on stage with the greatest musical legends on the planet? Grab a hat and jacket and stand alongside “King of Pop,” Michael Jackson as you recreate his Smooth Criminal music video. Next hop on stage next to superstar Rihanna – you’ll even look the part thanks to the collection of fun and extravagant outfits. Pose with Miley Cyrus and hear the crowd scream as you melt the hearts of thousands of idolising fans. Film - Take a guided tour through movie making history. Leave your VIP trailer and prepare for your starring role alongside Marilyn Monroe in “Gentlemen Prefer Blondes” before performing martial arts with Jackie Chan. Your singing skills will be put to the test next as you join Olivia Newton-John and John Travolta for some “Grease Lightning” in a scene from the iconic musical “Grease”. Before you know it you’ll be on Eliot’s bike pedalling ET through the night sky in our recreation of the iconic movie scene. History and World Leaders - Guests enter the American Civil War where they can meet Uncle Sam and enlist in the army. Witness Abraham Lincoln sign the Proclamation of Emancipation which abolished slavery and came as a result of America’s northern success in the Civil War. Next be whisked forward in time to the historical moment when man first stepped on the moon. Stand side by side with Neil Armstrong and plant the American flag victoriously on the Moon! Complete your trip through American history with a visit to the Oval Office and sit at President Barack Obama's desk. Sports - The sounds of stadium crowds can be heard cheering you on as you enter the Sports Zone! Your first stop is in the gym with Muhammad Ali. Grab some boxing gloves and spar against the champ for a fantastic photo opportunity. Your next stop is only a short jog away as you join tennis ace Serena Williams on center court. Then take on Tiger Woods on the green, shoot some hoops with Shaq O’Neal or meet David Beckham. TV - Enter via back stage to hear “knock, knock, you’re on stage in 5"! – welcome to the TV Zone, a celebration of America’s popular television shows. Your journey takes you into a LIVE TV studio where only the most popular shows are filmed. Be part of Oprah’s show and take a seat, see yourself on the big screen. Have a laugh with Jimmy Fallon before you have your photo taken for the “Modern Family” wall with Sofia Vergara. Arts and Science - Enter Einstein’s laboratory and test your IQ on his interactive blackboard. Challenge your accuracy and skills with the Edison interactive and try not to touch the metal wire. ‘Can you keep all 3 light bulbs on?’ Enter our Popart set and see yourself as an Andy Warhol ‘masterpiece’, then conclude your journey by meeting Apple co-founder Steve Jobs. Authentic History - Take a journey, 200 years back in time when Marie Tussaud first opened the doors to her Baker Street bazaar. Explore her past and uncover the dark beginnings of our world famous attractions. The interactive story tells the dramatic and sometimes dark story of Madame Tussaud’s life and the legacy she left behind, accompanied by authentic props from the Madame Tussauds archive. 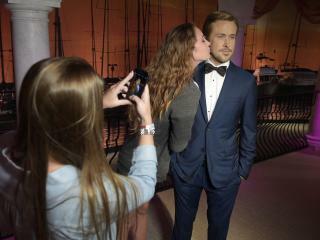 You’ll also learn what it takes to create a celebrity wax figure. Madame Tussauds Orlando is open daily from 10.00am to 10.00pm (11.00pm on Saturdays). Madame Tussauds Orlando is part of the I-Drive 360 complex located at the heart of Orlando’s International Drive. There are plenty of bars and restaurants at I-Drive 3360, making Madame Tussauds Orlando a great attraction to visit during the evening. You will be sent an open-dated Madame Tussauds Orlando e-ticket that can be used at any time on your holiday. Tickets allow one admission to Madame Tussauds Orlando. Last admission is 1 hour before closing, giving you plenty of time to go around the all new Madame Tussauds Orlando and meet your favourite stars! Children aged 2 years and under visit for free.